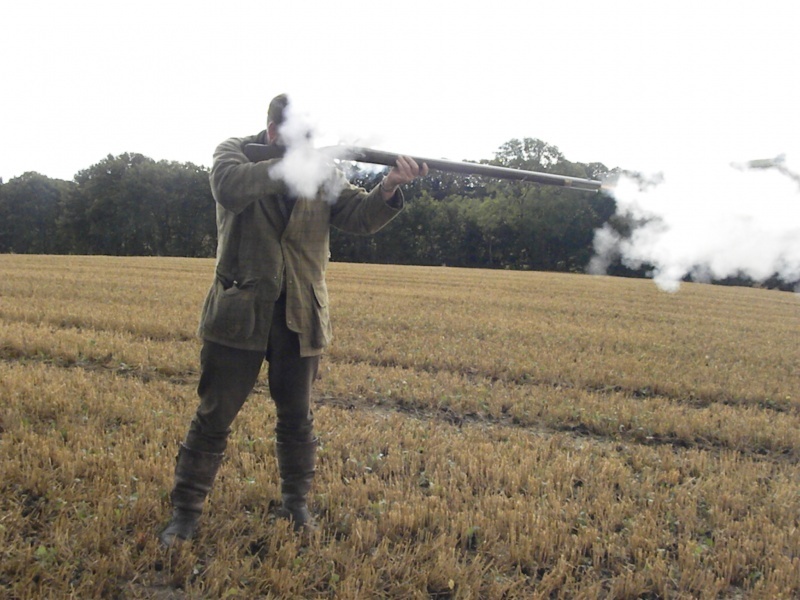 Using Black Powder, or Gunpowder, in a muzzle loading weapon is great fun and learning the skills to load consistently and accurately add another dimension to shooting. 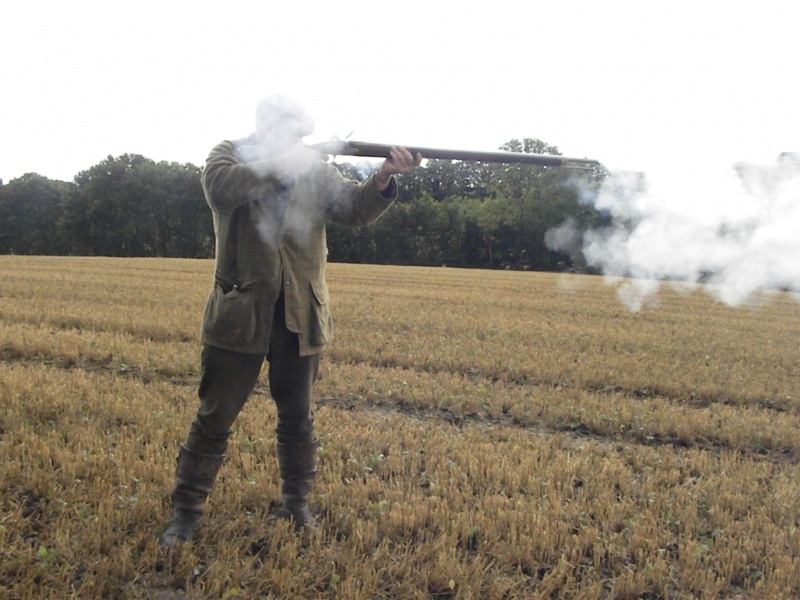 This page is intended to be a introductory guide to shooting black powder, providing some background information and basic facts. It is not intended to be an instructional document and anyone intending to shoot any weapon using black powder is strongly advised seek face to face advice and instruction from an experienced practitioner and to contact one of the clubs which enjoy these tremendous weapons. Stonehenge Arms cannot and does not accept any liability from any incidents arising from any advice, inference or instruction contained on this website whether intended or otherwise. Black Powder is great fun, but it can be dangerous and like all firearms it can be lethal if misused. Black Powder is an explosive and it can obviously be very dangerous. That said, it is not something to be afraid of. Occasionally people forget just how dangerous petrol can be and it can kill them, but for the most of us, we handle or use it every day without mishap. 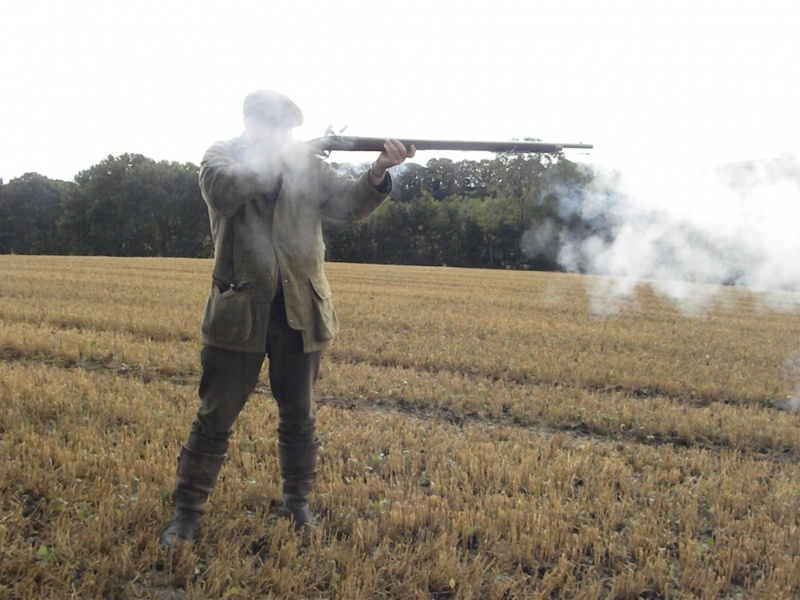 To use a muzzle loading gun you can use black powder or one of the black powder substitutes such as Pyrodex. To use black powder you will need to get an explosives licence from the local police. These are easy and straight forward to get. You just need to show why you need the black powder and owning a muzzle loader is good enough reason. You will need a wooden box to hold the powder. The box has to conform to specific standards which are on the Home Office web site, but the specification is not challenging. I can supply a box for £75, but one can be made at home for for much less. If you go the route of the black powder alternatives, you will not need an explosives licence. My general advice is to get a licence and use black powder as it is what the guns were made to use, but there is no great problem either way. 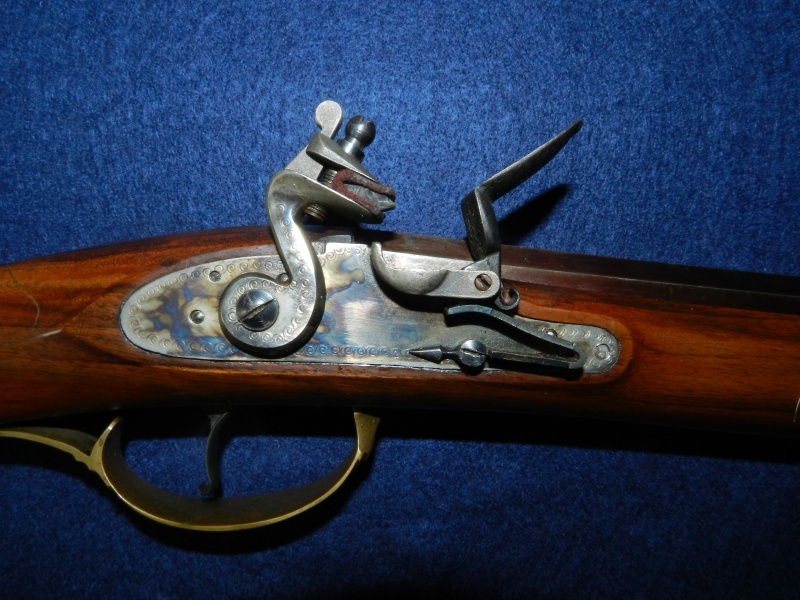 The two common types of muzzle loader are the flintlock and the percussion gun. Flintlocks are great fun, very spectacular and give you the chance to buy more tools and fiddle with things between shots. They are not hugely reliable and do not like wet weather. A percussion cap is almost weather proof, very simple and will generally give more reliable ignition. You may also come across the Match Lock which uses a burning length of cord to ignite the pan and is very simple, good fun but not very practical, and the Wheel lock which is an impressive bit of engineering using a wind up coil spring to turn a wheel like an automatic cigarette lighter. These are very rare as reproductions and very expensive as originals. Muzzle loading game guns, be they single barrel or doubles, will obviously be smooth bored. 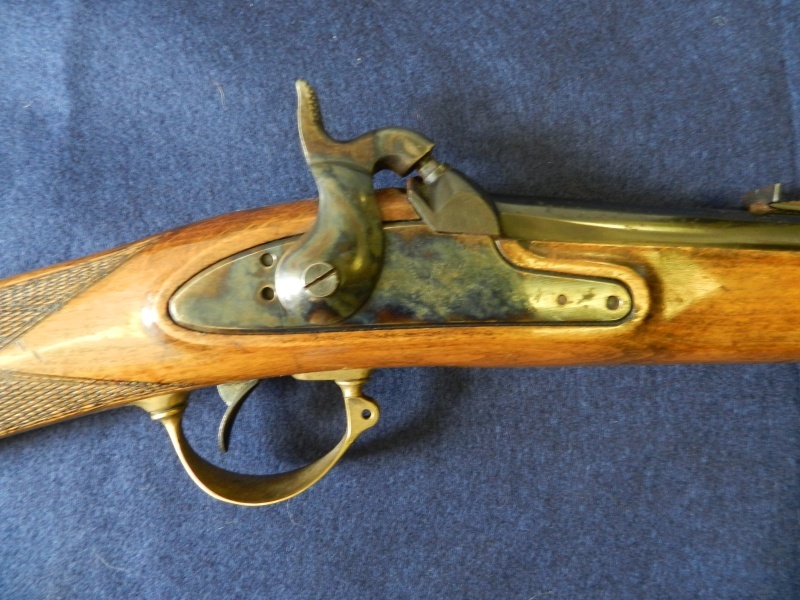 With the "rifle type" guns you may have a choice if you are looking at reproductions. A rifled barrel will give you better accuracy of course, but a smooth bored version will still shoot a patched ball out to about 100 yards with enough accuracy to be good fun, and hit the target. The great advantage of a smooth bore is that it can be used on a normal section 2 shotgun certificate; there is no need for FACs or variations, so life is simpler for those of you who live in areas where the police take months and months to turn round a simple variation. 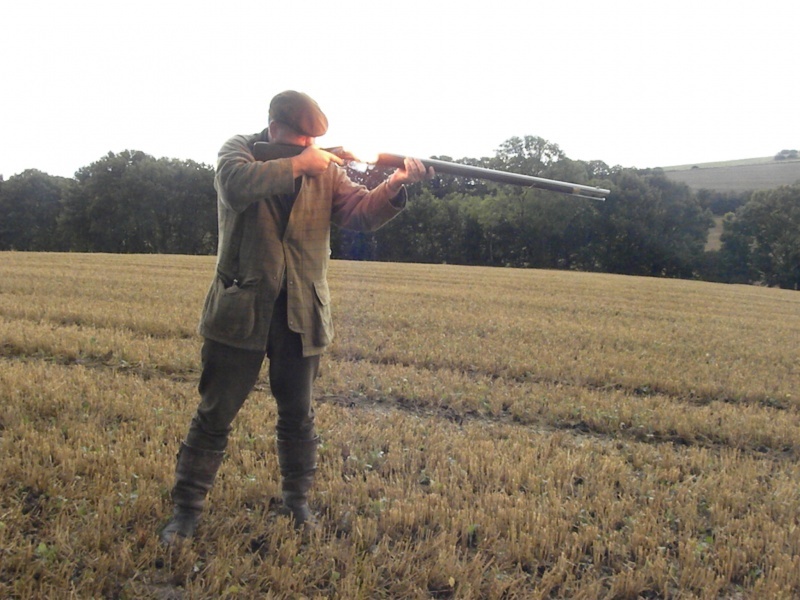 With a smooth bore you can also shoot bird shot and make a tidy rabbit or pheasant gun if you fancy something a bit different. 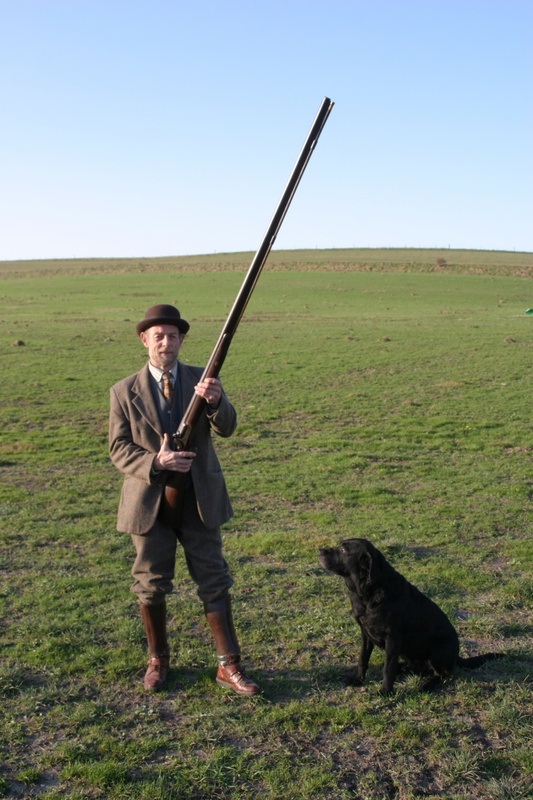 This distinguished looking gentleman is holding my 4 bore bank gun. It has a 60" barrel and is ignited by a percussion cap. I have raised a few eyebrows at a clay pigeon shoot, but this type of monster cannot be considered the best option for practical shooting. These photos are of me using my Brown Bess replica. 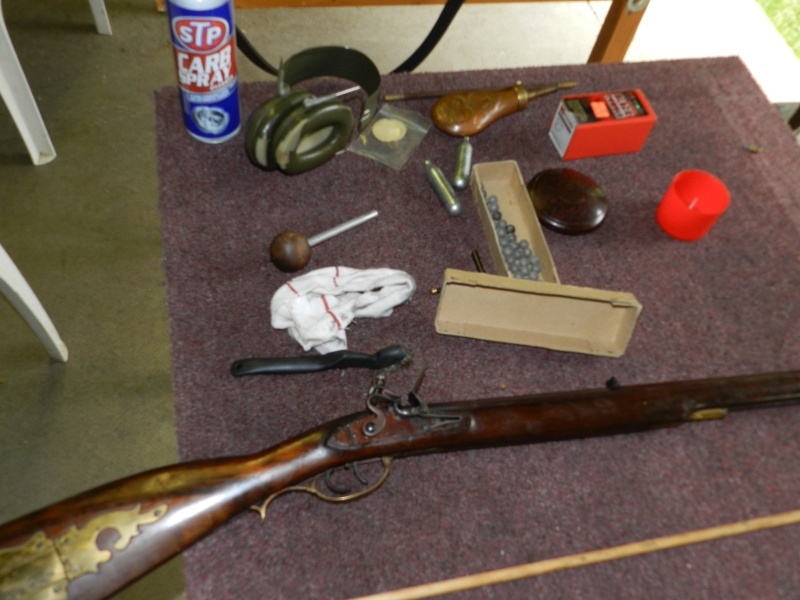 The .75" musket calibre equates to about 11 bore, and with 1 1/4 oz of no. 6 shot it makes a great tool for game shooting. Wait to for the smoke to clear before sending the dog to retrieve.